Life and Death is another great book by James Davies from the Elementary Go Series, republished by Kiseido Publishing Company. Each of the 36 chapters is devoted to a single concept or life and death formation, beginning with the most basic life and death formation, the unsettled three, progressing through notchers, the L groups, the J groups, and Carpenter's Square. Chapters consist of a page of explanation followed by five or six problems that build upon that explanation. Answers to the problems appear on the overleaf. The problems are wonderful material for a Go Grinder problem collection. Anon: I've got this book. It ranges from the very easy (unsettled three) to more difficult positions. Very good to have a good idea of what life and death is about. kokiri this is an excellent book that covers a great deal from the basic killing shapes to the carpenter's square and much in between. There's a good mix - enough problems to keep you thinking, but broken up into short chapters to keep you interested. malweth This book can be very hard for the L&D Beginner (that's me...), but introduces good L&D concepts. I'd recommend pairing this with Life and Death from gobase.org and Beginner Exercises - it's been working for me so far! boubou? Be careful, there are some mistakes in this book, and a lot in the chapter covering the carpenter's square. Grauniad: It would be helpful to others if you could report such mistakes in the /Errata subpage. nr330? :Boubou is correct. There are quite some mistakes. I'm on page 65 and just spotted another. Though, they are not very annoying and are some kind of check up that you really go through the problems, not just reading the book :) Like a teacher of mine who did a mistake here and there to raise tha attention. 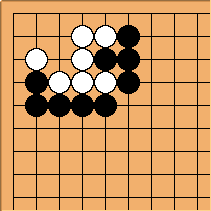 I'm not really strong (around shodan) and davis is 5d so I doubt that this kind of mistakes would not be noticed. cultureani? : I'd like to second Grauniad's suggestion: please do add the errors to the /Errata page; exposing the errors to the light of day would be really helpful for DDKs. Thanks. 17. The One-Two Points, Etc. 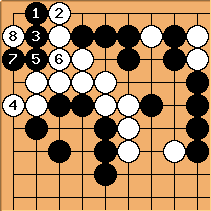 An analogous position arose at move 123 in the sixth game of the 64th Honinbo Title Match between Hane Naoki and Takao Shinji. 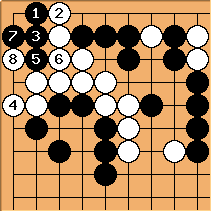 In that event, due to the White group having access to the center and the possibility of forming an eye there, Hane chose the path to ko in the corner. Result: twisted four in the corner, alive due to liberties on the outside. Result: Living shape in the corner, which white can approach due to outside liberties. 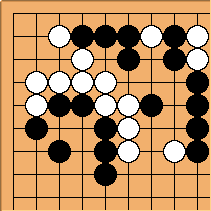 Result: 6-move approach ko (at least!). So the normal ko variation is better in this case.